If grams matter, you might be interested in e*thirteen's new XCXr crankset that weighs just 392 of them. 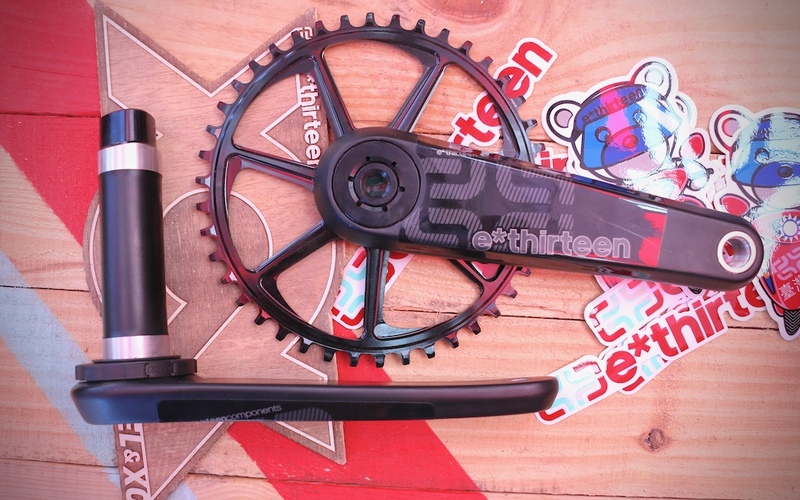 e*thirteen's downhill and enduro-focused LG1R carbon fiber cranks got all the attention when Kazimer reviewed them a few days ago, but there's also something new for the weight-watching set. The XCXr crankset that comes in at just 392-grams, otherwise known as "The lightest mountain bike cranks on the market,'' according to e*thirteen. I'm sure there's a crazy smart German or Italian out there making their own carbon arms that weigh 57-grams and cost a few thousand euros, but can you find a set of mountain bike cranks that are attainable and lighter than the XCXr arms? I can't. There's the usual 30mm spindle with its triangular 'P3 Connect' interface that e*thirteen employs for all of their cranks, although it has been moved to the non-drive-side arm for 2020 to make installation smoother. 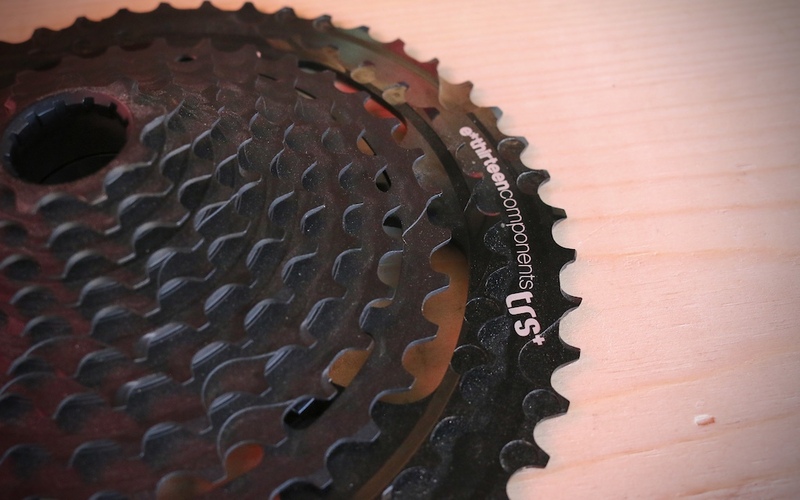 They've also designed the 1X-only chainring interface so that you use a 3mm washer to get the 'ring in either the Boost or non-Boost position. Length options are 170mm or 175mm, and they go for $399 USD. 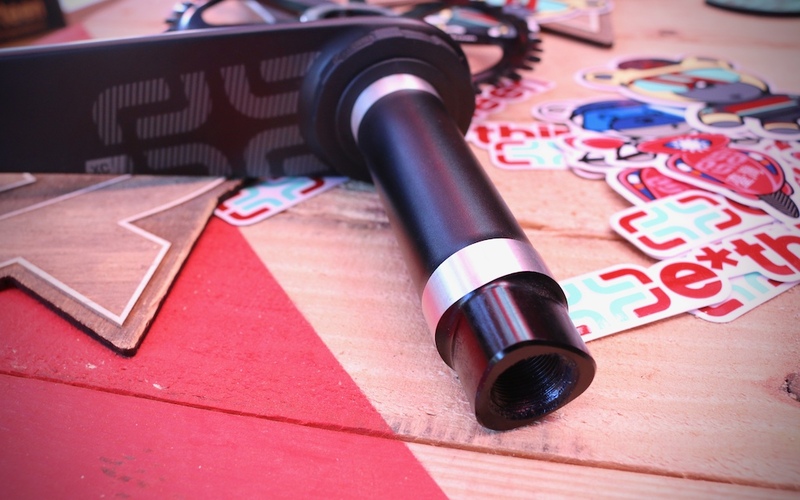 The XCXr crank has 30mm diameter spindle with e*thirteen's triangular 'P3 Connect' interface. A 9-tooth small cog and 50-tooth big cog add up to a monster 556-percent range for e*thirteen's new TRS+ 12-speed cassette. If you want all the range from your drivetrain, you'll probably want to check out e*thirteen's new TRS+ 12-speed, 9-50 spread cassette that provides a whopping 556-percent. No reason to walk if you have this thing on your bike. It's a two-piece design, with the bigger cogs being aluminum and the smaller ones manufactured out of steel, and the two pieces lock together after you've clamped the bottom section onto your freehub with a 3mm hex key. The 398-gram TRS+ will be available soon, and it'll sell for $299 USD. High Above's prototype hip bag uses FidLock's Bottle Twist magnetic bottle attachment system. 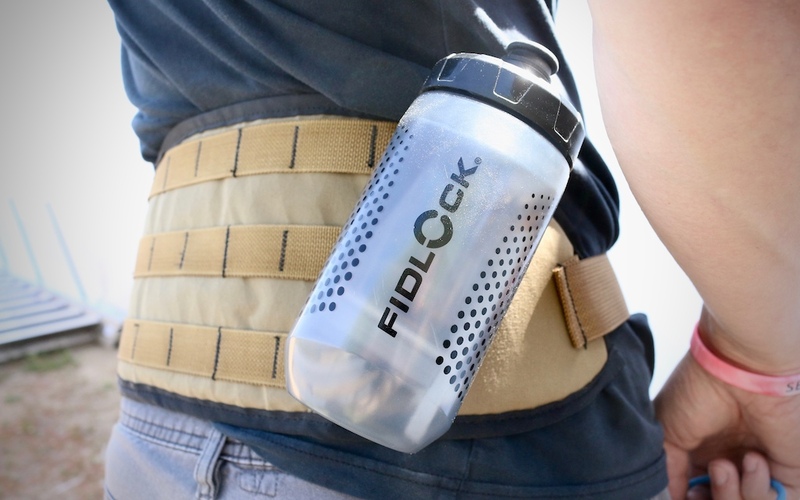 Remember FidLock's Bottle Twist magnetic bottle attachment system that RC checked out last summer? How could you forget! 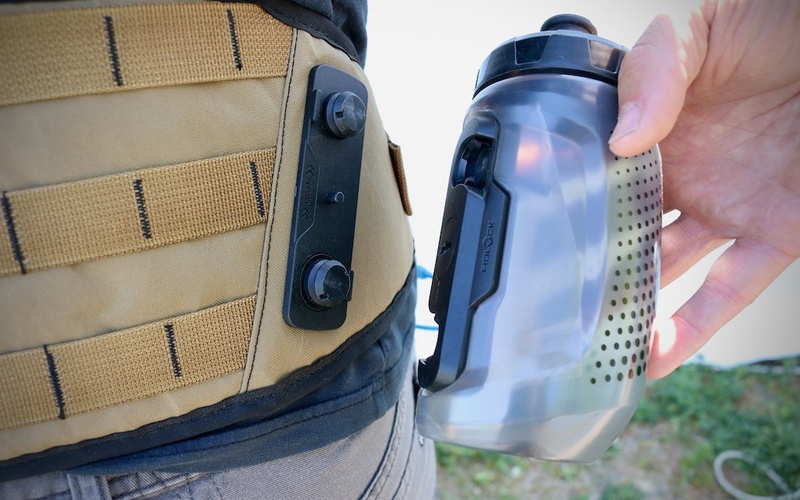 Bellingham's High Above is working on a modular hip pack design that uses that same FidLock system to carry a bottle. The idea is that instead of reaching to slide your bottle back into its sleeve (or stopping altogether to put it inside), you can just snap it into place via the magical power of magnets. The production version will have a modular storage layout, too, so you'll be able to choose how big you need your hip pack to be. No word on pricing yet, but expect to see it sometime this summer. 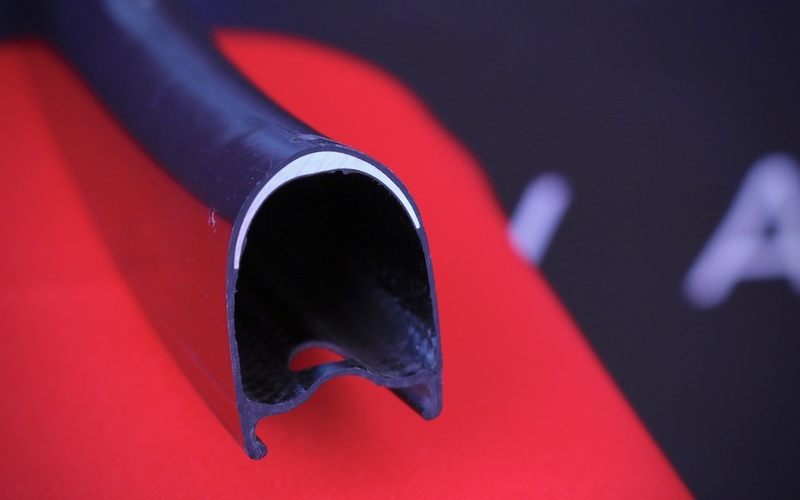 Vant uses small sections of aluminum for reinforcement at the spoke holes of their carbon fiber rims. These carbon fiber rims look a lot like, well, carbon fiber rims, but they're hiding something. If you cut one in half close to any of the 24 spoke holes, you'll find small aluminum inserts that have been molded into the rim. Vant actually extrudes what looks like a very thin, very lightweight single-wall aluminum hoop before cutting it up into small sections that are then inserted into the layup during the rim's construction. If you're thinking back to the late-90s when companies used to wrap aluminum components in carbon to make them look cooler, you're probably not alone. Aside from be reversed, this is a different thing, Vant told me, because the small aluminum inserts mean that they can use a lot less carbon at the spoke holes. They also said that it makes for a lighter but stronger rim than if they were straight carbon fiber. Vant offers two wheelsets using these carbon and aluminum hybrid rims, with the B25 being their 1,470-gram 29er cross-country setup that goes for $1,450 USD. Internal rim width is 25mm. If you want to go wider, it's the 28mm wide B28 wheelset that weighs 1,568-grams and costs the same as the B25. 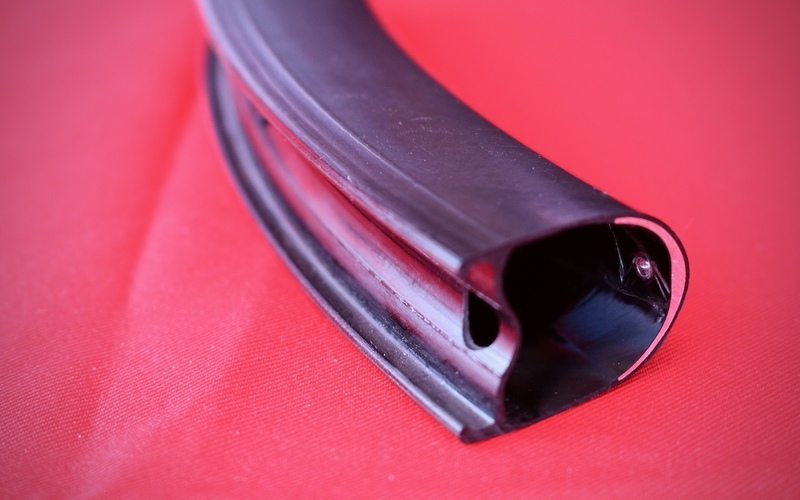 Vant says that the aluminum inserts make for a stronger, lighter rim. And I read that with my David Attenborough voice. @Zaff and if it is fortunate enough, it will mate with a Chris king or 240 hub, otherwise it will meet a grisly fate at the hands of a novatec hub, which will die long before it does. Lightest crankset. Yes! Hey why didn’t you make it 352g? You are already in “hit a rock > disintegrate” category, why bother when you can be famous. Just put a lifetime warranty on it and people will line up to buy it. Most of them won’t break it and at least half of those who will, will praise you for great customer support. With good setting of margins you can make a good business since having a crankset that is lightest by a fair margin allows you to ask for more than anyone else, while production costs are the same. Haha, my backpack, with water, and tools, weighs ten pounds (AKA 4500 grams). That's ridiculous. Pretty much throws any weight argument out the window, with, "just ride without a water backpack". Just make sure you say: we did lots of testing and we are so confident in our product that we are giving lifetime warranty on it. Then say: we fine tuned the layup so that it is stiff enough for pedalling but compliant enough to take hits. We use ballistic resin that withstands hits better than a regular resin, and we provide crank shoes for ultimate protection. Our cranks are X% stiffe than our previous model. Our team rider Morgan Schugenkleutzfahter: I need good components and E13 is a company that listens to riders and never rests to bring the best components they can. It’s funny how by the time they release a product they are already working on something else. Kind off what Santacruz do with their frames, give you a life time warranty & charge you twice as much as it is would be worth? I’m sure there will be some XC racers that will be stoked. Lots of crazy gram counters out there! PB prob isn’t the audience for it but let’s save criticism for some long term reviews. BTW does WAKI even ride? I always just see weird long posts about EVERY topic/product. Nauseating. If it doesn't fit a power meter system will XC racers even buy? @PinkyScar: Powertap hubs to the rescue! There have been ligther ultra reliable cranks on the market for years. My Race Face Next SL is 360 grams in 170 length. And this is from 2015, two generations ago, the newest ones are lighter by few dozen grams and still pretty much unbreakable. @lRaphl: But which weighs more, and what about rotational weight, and are they superboost xc downcountry compatible? @PinkyScar: You can be sure that if they aren't supporting all the MTB standards right now that they will create a sh*tload of new ones since they just have been bought by SRAM! @covekid: If one person runs Ti axle Eggbeaters on Next SL cranks, and steel axles on XCXr cranks, who is faster? Not a fan of carbon rims in general, mostly because I think it is a bad idea to drill spoke holes in the laminate and then load these trimmed edges out of plane. These inserts solve that. Yes I think the use of metal inserts in a laminate is a better use of carbon than to make it "full carbon" just because that would allow you to say "full carbon". So if they feel the need to make carbon rims, from a technical point of view I think these are some of the best out there. Weren't Shimano's last XTR wheel a carbon/alloy composite? @acali: lightweight aluminum rim with a carbon shell essentially. Looks like a weight belt with a water bottle clip. @WAKIdesigns: is like to buy in to your proposal, tools & and supplies on a collar and cuffs set. For the professional endruo bro. @Kickmehard: and the portable pump serving as... THE BATON! @WAKIdesigns: if you can add a hydration pack cravat i think we will have the complete package. That waist belt looks awesome! I can strap my holster and a couple of magazines to it, probably a tactical flashlight and leatherman too. I'mma look so awesome with my tactical shotgun strapped to my fanny pack. Because north americans are using power inches not power meters. @faul: so they have 39,99 times less Power than the rest of us? @faul: you do realize that Canada uses the metric system? @Skooks: Canada was the cold part of murica right? Is carbon rims breaking at the spoke hole even a thing that needed fixing? Every carbon rim I’ve seen that was broken, and most of the aluminum rims I’ve seen damaged beyond repair has been at the bead. I killed a carbon rim a few months back when my foot got jammed in the spokes during a minor crash (no idea how that happened...) which resulted in several spokes getting pulled through the rim bed. With a stronger rim bed, I may have just snapped those spokes like I did to the rest of the wheel rather than destroying the rim, which would have meant a quick spoke replacement job rather than a whole new wheel. Fortunately, the wheels had a no-questions warranty, so I got a new one for just the cost of shipping the busted one back, but without that, I would have been out a lot of money for a really dumb crash. Crazy German or Italian out there making their own carbon arms that weigh 57-grams and cost a few thousand euros, you said? I wanted to love hip bags, but found the strap around my abdomen to be much more of an annoyance than wearing a hydration pack. Though most rides are water bottle only, and/or water bottle in my bib pocket. Nothing new to see on the cranks. Race Face G4 cranks have been around with no major durability issues for a couple years now. 430g including 32T chainring (58g) = 372g. Am I missing something? Yep - the 398g on the e13 cranks are also with 32T chainring. Hook up a drinking tube to the helmet pads. Free electrolyte drink! 100% organic! Until people decide it's no longer fashionable to ride with a helmet. @vitesse: That's crazy talk. Where am I supposed to put the beer then? I ride with 34t (oval) in the front and a 11-36t (10 speed XT) cassette in the rear. With a new cassette and a new chain, in two weeks or so of riding I've developed burrs on the smaller sprockets and they start to skip. I can deburr them a few times until I need to replace them. Doable, they're about 6 euro a piece. No doubt I'd love to stomp on those 10t and 9t sprockets but I'm sure they'd be gone even quicker. And I don't know if you can buy these XD sprocket per piece too. My frame doesn't accept larger chainrings though so I'll just live with this. @ceecee: Could you explain? I don't get it. Only a matter of time before you can get a multi tool recess surgically implants, just dont forget too take it out when going on a plane? That hip strap thingy looks no smaller than a back pack that carries just as little, so perhaps just as sweaty. i guess the military has finally hit the bike market. I know what alot of people are thinking and no this would not be a viable solution to carry while riding. Magnets , elements, $700 piece, no thanks I'll stay packing the right way.